Have you ever been in a meeting and couldn't stop passing notes back and forth between friends also at the meeting/conference/class? Those side-conversations are what's known as the "back channel" of a presentation, and there's a Web 2.0 tool to help bring note-passing to the 21st century. I learned about it at a education conference last summer, and lately, Mrs.K and I have been using it in our literature class with 6th graders. What I love about TodaysMeet is its simplicity; it takes less than a minute to set up a page, and no one needs to join beyond typing a username and clicking "Say!" 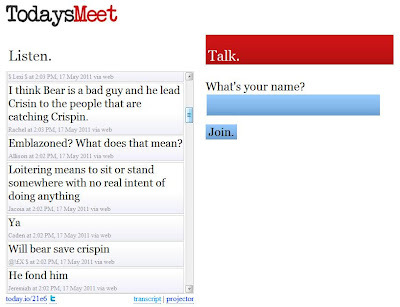 Right now in Lit class, we are listening to an audio book called Crispin. While the story is playing, we project our TodaysMeet web page onto the front board, where we can all see what's being said. There are 10-15 iPod Touches in the room, and the kids share them, taking turns entering their responses to the story. Their contributions pop up on the large screen immediately. In a typical class period in which the teacher is reading a book aloud, students learn about how to read fluently and that reading can be an enjoyable activity. Read-alouds are not really the time/place for lengthy discussion. Talking too much during read-alouds messes up the continuity of the story. Yes, kids are having thoughts, making predictions, wondering, etc. but they aren't sharing them unless called upon. The beautiful thing about TodaysMeet is that everyone can contribute their thoughts or ask questions in real time without interrupting the flow of the primary activity. Whereas in the past, only a handful of kids would ask questions, etc. about stories we read, using TodaysMeet, now they all do, and the best part is that they are also answering each other's questions via the backchannel, unprompted by us. Participants can also participate via tweet. Our students receive a grade for participation (and no, spelling doesn't count). I love this, because even shy kids can contribute, and so many more students participate than just the typical "eager beavers." Kyle and I are planning our trip to CA in mid-June. SanFransisco and Oceanside. What should we do while we're there? All you have to do is type in your name and click on "Say" and then type a message in (there is no "joining" process beyond that). If you use Twitter, you can also participate by sending a tweet using the hashtag #mrs4444trip. This way, I can collect your ideas without getting a lot of emails to read; instead, the ideas will all be in one place. If you want a response, be sure to use a name I recognize :) You're also welcome to just pop in to say "Hi. Look at me! I'm using a cool Web 2.0 tool!" or just check it out. Thanks! What a great way to keep the kids engaged and on task while listening to the audio book. I love this! Teaching methods have certainly expanded over what they were when I was in school. I can see why even shy kids would participate in the discussion this way. I think that is great and I imagine they are comfortable using this form of communicating and participate more. Lets face it we are a techi world and this generate even more so. I love this idea! I love how it can bring the kids together while learning at the same time! I love it too. There's a lot more going on in our minds that just the storyline when someone is reading. My problem when "listening" to books is patience because it's so much slower than doing my own reading. Good way to encourage participation! I am SO intrigued by this. I read to my students all the time, and they text all the time. My brain is buzzing with the possibilities here. Maybe I could use it while they peer edit essays, too. Really interesting, a great example of how computing is changing the way teaching and learning, increasingly giving more importance at the student who takes a more active development. Greetings. Great find - you'll see my suggestions up there are your todaysmeet. Hmm, I wonder if that word is going to be a buzz word like twitter or groupon. I like how easy it is to use. I even started one for fun but I didn't tell anyone so I'm just there by myself for now. The room is called lisleman - so descriptive I know.